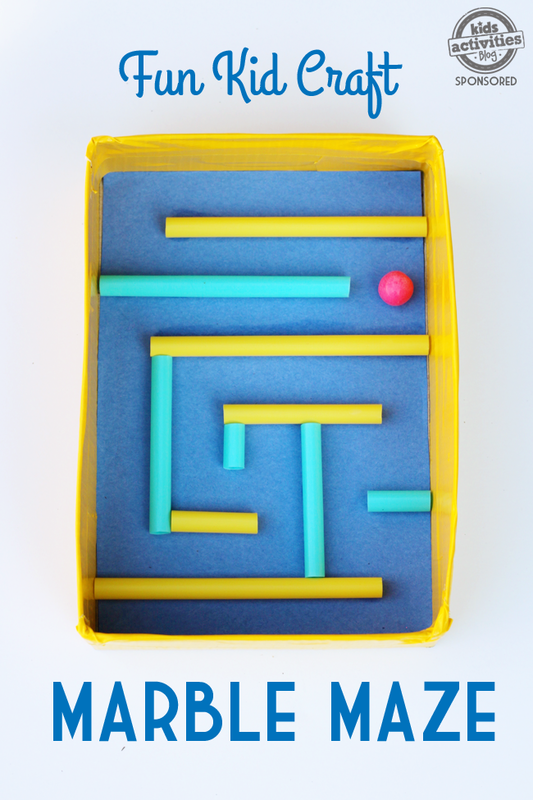 Your kids will love making this fun and easy marble maze. The only thing more fun than making it is playing with it! We’ve partnered with our sponsor Horizon Organic, to bring you this creative kid made toy. We love giving kids the chance to design their very own toys, this activity fosters independence and nurtures imagination. 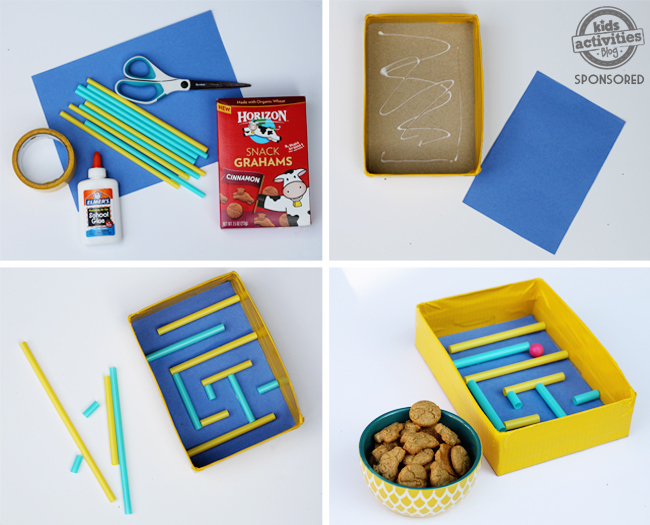 Gather a few basic supplies and a few snacks to fuel all that fun, and you’ll have your own marble maze in no time! First you need to cut the front panel out of your box. Next, tape the small flap back in place so that you have four even sides. You can cover all of the sides in tape for decoration. Next cut a piece of paper to fit the bottom of the box and glue it in place. Now the fun part: create your maze! Cut straws to different lengths and glue them to the bottom of the box. This is a great creative exercise for kids. They just need to be sure that the marble can fit through the spaces and make it all the way to the other end. Let your little engineer experiment before the glue dries. Let your creating dry and get ready to play! Now you get to play! Simply place a marble at one end or corner of your box and tilt the box to guide the marble through the maze to the other side. All that maze designing is sure to work up an appetite. Horizon Cookies and Crackers make the perfect craft-time (or anytime) snack. 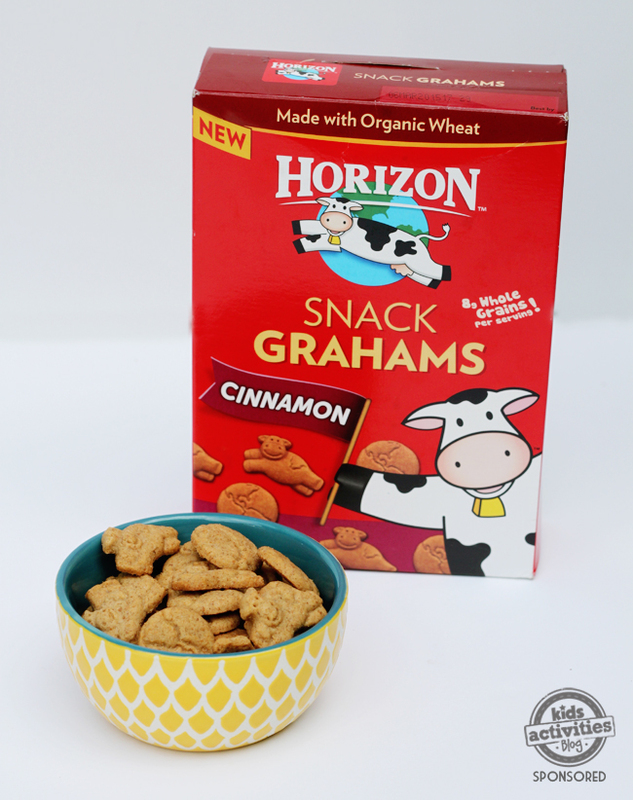 Our kids love the Snack Grahams because they are delicious and oh so cute. We love them because they are made with organic wheat and have 8g of whole grains per serving. Oh, who are we kidding, we love the taste too! Connect with Horizon on Facebook, Twitter, Instagram, and Pinterest to learn more about their great new products and discover more cool curious kid activities like this one!